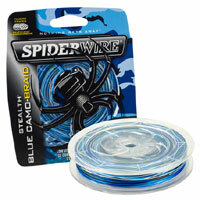 Spiderwire Stealth Blue Camo is made from Dyneema, the world's strongest fibre. Blue Camo is uniquely coloured for blue water lakes and saltwater conditions. New and improved stealth braid is constructed to provide ultimate strength with the thinnest diameter for smooth and quiet performance. The no stretch properties of Dyneema PE fibres provide incredible sensitivity to instantly detect bites and structure.  Varying blue/white/black colour pattern designed to blend naturally with open blue water conditions.  Colour-Lock coating technology - casts further, lasts longer.  Dyneema PE Microfibre construction is strong, smooth and round.  Fluoropolymer treated microfibers - shoots through guides like a bullet.  Whisper quiet for 'Stealth Attacks'.  Resists digging in on reels.